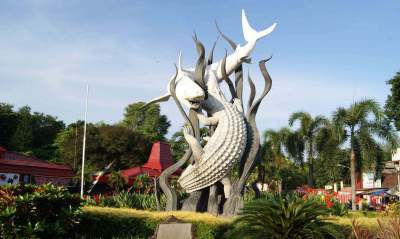 Surabaya Tour Package. The city of Surabaya is the largest city in East Java and the capital of East Java province. Surabaya is a metropolis that is the center of business and provincial government. If you come to Surabaya, you will find many interesting tourist areas, shopping centers and typical Surabaya local food. Holidays in Surabaya Indonesia has many tourism spots and nightlife in Surabaya. You can watch traditional bull races and jadih hills in Madura, see sunrise on Mount Bromo, and visit waterfalls (Madakaripura and tumpak sewu) and ijen crater tour. You can consult your trip while in Surabaya by contacting us so that your time can be maximized. We are a Surabaya travel agency who offers the best tour packages. Here things to do in Surabaya and surrounding areas on your holiday. To find the best places to visit in the city of Surabaya, we summarize into several categories of destinations that are highly recommended in your tour. Arriving in Surabaya, the first tour you need to visit not far from the center of Surabaya is a visit to the Sampoerna Museum which was once known as the oldest cigarette company in Surabaya, Surabaya, China with its China Temple, which was built in 13th century. Bridge, visit four faces Buddhist, submarine monument, etc. Other options around Surabaya that you can visit during one day are to Mount Bromo. The active volcano with a distance 3-hour drive from the city center of Surabaya is one of East Java’s tourist attractions. This volcano is located in Bromo Semeru Tengger National Park. Most tourists who want to visit Bromo from Surabaya for a day are Bromo Midnight Tour so they can see the beauty of Mount Bromo without having to stay overnight. If you plan to stay close to Bromo, cemara indah hotel is one of the hotel choices with a direct view of Bromo. But if you prefer a luxury hotel, it is recommended Jiwa Jawa Resort Bromo. Surabaya holiday package 2 days in general, many of which are taken by tourists from Singapore, Malaysia Thailand etc. is a Surabaya tour by combining 2 tourist attractions namely the city tour of Surabaya and Mount Bromo. Surabaya tour package Singapore Malaysia has increased number of visits when entering the holiday season April – December. This trip is directly by pick-up from the airport or station then to tourist destinations around Surabaya and Bromo by staying 1 night near Bromo. Typical food in Surabaya is something you need to know when coming to this place. As a business center in East Java, of course there are many types of culinary that are served throughout this city. One of the few places in Surabaya that still sells traditional food & food from Surabaya is Lontong Balap Garuda “Pak Gendut,Rawon Setan,Soto Madura etc. You can find a variety of flavors, ranging from savory spicy Arabic, Chinese, Javanese to local extremes. If you have other ideas, just contact our service for the information and tour booking.